The Sun Foundry on Dewsbury Road in Leeds was established in 1844 by Charles Todd who had begun his career as an apprentice at Fenton, Murray & Jackson's Round Foundry. In 1837 he co-founded the first locomotive manufacturers in the Hunslet area of Leeds: Todd, Kitson & Laird. This company lasted just a couple of years before splitting in to two firms operating either side of Pearson Street; Kitson, Thompson & Hewitson in the Airedale Foundry on the north side of the road and Shepherd and Todd in the Railway Foundry on the south side of the road. In 1844 he left the Railway Foundry, which then continued under E.B.Wilson and James Fenton. Charles Todd's Sun Foundry manufactured some 0-6-0 locomotives for the Hull & Selby, York & North Midland and Newcastle & Darlington Railways from 1844 to 1848. Also 0-6-0s and 2-4-0s were supplied to railways in Belgium. About 20 locomotives are thought to have been built by Charles Todd at the Sun Foundry. Our database has records of 11 of these that were supplied to UK railways from railway company records. W.O.Carrett had previously worked at E.B.Wilson's Railway foundry. The bulk of the work carried out by the new firm would be pumping engines, something in great demand not only in the increasing number of water works being established to cope with the increasing use of flushing toilets and internal plumbing in homes but also in several industries, particularly mining, as well as filling boilers in mills and factories. The company produced a small number of locomotives including orders for the Kendal & Windemere Railway and the Natal Railway in South Africa. 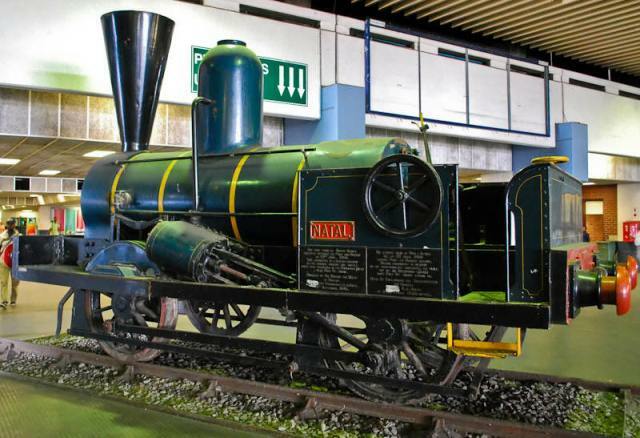 The Natal locomotive, named Natal, partially survives and has been reconstructed for static display in Durban station. This locomotive has the distinction of having been the first locomotive to haul a public train in South Africa in 1860. Originally Natal was thought to have been built by "Robert Legg" at the "City of London Engine Works." However Robert Legg was in fact an agent for Carrett Marshall and the "City of London Engine Works" despite its grand title was more likely just an office. Photo by Alan Wilson, courtesy of Old Steam Locomotives in South Africa. Below is an excerpt from Carrett, Marshall & Co's order records detailing their locomotive work, taken from the original order books in the Leeds Archives. 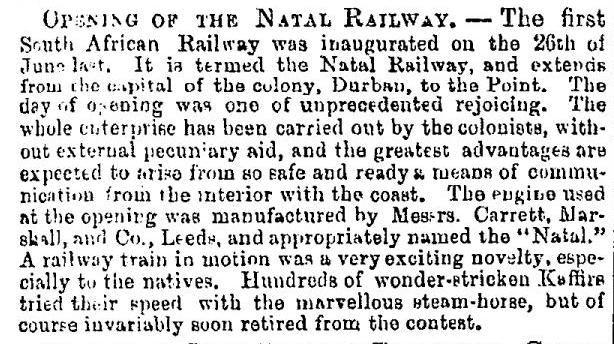 Strangely the Natal locomotive is not recorded directly, only mention of 'duplicates' for it. The records are quite short on details of the items and the names shown as customers may have been agents so it is hard to say where some of these engines may have operated. Carrett, Marshall & Co were also commissioned by George Salt of Saltaire firm Titus Salt & Sons in 1861 to build a 'steam pleasure carriage' for him. Works number 790, this machine had a locomotive type boiler "two feet six inches in diameter, and five feet three inches long." It had two 4ft-diameter driving wheels and a 3ft-diameter leading wheel. It was designed to seat 9 people, including the fireman and steerer. 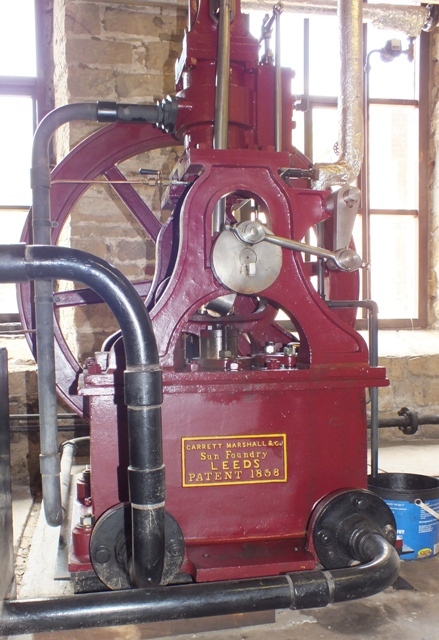 The engine was exhibited at the Royal Agricultural Show held in Kirkstall, Leeds in 1861, and the International Exhibition held in London in 1862 where the machine was displayed alongside their 2-cwt steam hammer. The engine was later given to Salt's friend Frederick Hodges, the new owner named it 'Fly by Night' and became notorious for driving it recklessly around Kentish villages, the vehicle having a top speed of 25mph! After a number of fines he disguised the engine as a fire engine and dressed his passengers as firemen. This didn't fool the police, though ironically the engine went on to become a real fire engine. A notable name amongst the staff of the firm was works manager Mr Murdock, grandson of William Murdock. William Murdock worked for Boulton and Watt and is known to have visited the Leeds works of Fenton, Murray & Wood early in the firm's history and before the Rotunda had been built that gave the Round Foundry its name. William Murdock had worked on a design for a steam powered carriage that would have beaten Trevithick to achieving steam powered travel had Boulton & Watt not insisted that he ceased work on the project. William Murdock's working model steam carriage of 1784 was demonstrated by his grandson at the Sun Foundry. In recent years a full sized version has been built to prove that William Murdock's ideas would have worked. In 1872 the works was taken over Hugh Campbell, Alfred Davis and John Hathorn. Henry Davey, who had patented the differential expansive pumping engine in 1871, soon joined the firm. Previously Davey had been an engineering consultant in London and his engineering experience would become an important contribution to the company. In 1878 he became a partner and the company became known as Hathorn Davey and Co in 1880, though he left to return to London in 1887 his name continued to be used for a number of years. Henry Davey registered over 100 patents over his life, mainly relating to steam engines and machinery driven by them. A particually favorite was pumps, the company made several large pumping engines for use in water pumping stations. The above engine is a tripple expansion engine of 1910 originally supplied to Southfields Pumping Station in Newmarket where it pumped 1000 gallons of water a minute. The pumps themselves would have been on the floor below. This engine was very similar to engines used for marine engines, by using the steam three times before it was exhausted great savings in fuel and water could be made. As well as pumping water, other materials (you don't want me to be more spacific here) could be pumped with it and similar machines were employed at a number of sewerage works. 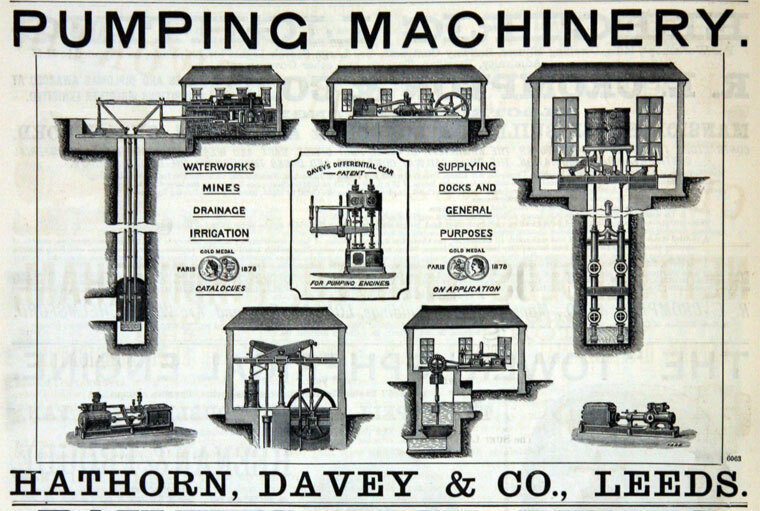 Though pumping machinery for water works and sewerage works was the bulk of Hathorn Davey's business the firm also made both pumping and winding engines for use in the mining industry both at home and abroad as the 1880 advert below shows. In 1901 Hathorn Davey became a limited company. In 1934, during a severe economic downturn, the company went in to liquidation and in 1936 they were taken over by Sulzer Pumps. Having taken over Hathorn Davey's Sun Foundry in 1936 Sulzer continued to use the Hathorn Davey and Sun Foundry brands for machinery produced in the Leeds works. In the late 1970s the company moved to a more modern facility at Manor Mill Lane in South Leeds. Sulzer Pumps are still designing and making pumps in the Manor Mill Lane works. The Sun Foundry was demolished some years ago and a car showroom now stands on the site. Above - An electric powered pump from 1964 at the Cambridge Museum of Technology in 2012. This would have been driven from a motor above the pump. Despite 28 years since the take over by Sulzer Pumps and 77 years since the departure of Henry Davey from the Leeds works it is interesting to note that the makers plate still says "Hathorn - Davey"
Amongst the pumps produced by Sulzer since they moved to the Manor Mill Lane facility were the boiler feed pumps for Drax power station, it is interesting to note that the firm has therefore made parts for the largest steam engine ever built in the UK. Sulzer's website boasts that "Some of the world's largest and most powerful pumps have been designed, manufactured, packaged and tested at Sulzer's Leeds factory for customers on all continents." Many of the early railway companies kept good records of their locomotive fleets and we've found records of many of the locomotives built at the Sun Foundry under Charles Todd. Our database contains the complete order records for Carrett, Marshall & Co (it's a long list but can be narrowed down by altering the fields at the top of the page). The only known survivors of Carrett & Marshall are the loco Natal and the pump in Armley Mills mentioned earlier. steamindex.com's page about Charles Todd. Old Steam Locomotives in South Africa's page about Natal. youautomobile.com's page about Fly By Night. Catskill Archive's page about works manager Mr Murdock and his grandfather's steam carriage model. Summary of a paper about the history of Hathorn Davey. Paper describing Hathorn Davey the economic benifits of compound engines. Graces Guide article about Hathorn Davey. Works order records in the West Yorkshire Archives.